ID Card Maker Software provides complete system to meet your specific ID card designing needs. Card designing program provides simplified methodology to create photo added ID cards in easy manner. Now it is easier to design ID cards, employee ID tag and badges with advanced Photo and Barcode technology support without any expert guidance or support. ✔ Make ID cards with use of ID card designing objects including Line, Ellipse, Pencil, Rectangle, Text, Arc, Star, Triangle, Barcode, Picture, WordArt objects. 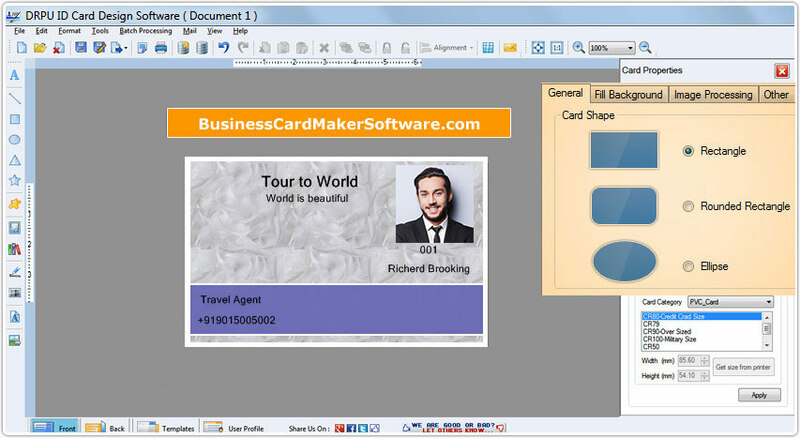 ✔ ID Card Maker Software easily generates and prints ID card with advance print option in easy to use graphical user interface. ✔ Make and create ID cards in variety of shapes including Rectangle, Rounded rectangle, Ellipse, CD and DVD shape. ✔ Option to include message using message templates during ID card designing process or simply add your own custom text. ✔ Option to select image from library during ID card designing process. ✔ Create folded ID cards in simplified way. ✔ Data Set Series feature allows to generate the multiple copies of ID cards with different barcode and text value. ✔ Option to print created ID cards using advanced print settings.